I’ll pose to you a question that I’ve asked several ministers along the way: Using the Bible, how do you prove that born-again unbelievers exist? The bible says, "And the Spirit and the bride say, Come. And let him that heareth say, Come. And let him that is athirst come. And whosoever will, let him take the water of life freely." (Rev 22:17 KJV) Can you explain why this cannot be characterized as an "offer" of eternal salvation? Do you believe it is possible for people to understand the true gospel without ever hearing it? Lately, I've heard a Calvinist argue that “regeneration is not salvation” and that Primitive Baptists are wrong in how they refer to regeneration as salvation. What say you, TETH? 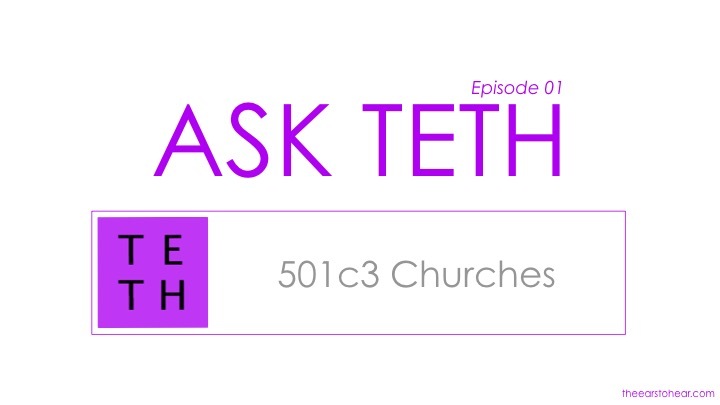 ASK TETH Episode 01 - What Do You Think About 501c3 Churches? I am anti 501(c)(3). I think it limits freedom of speech. What say you, TETH?